This roasted aubergine dish is pretty easy to make and packed with flavour. The version I made here is called baba ghanoush and is found all over Arabia. I had its close relative, moutabel when I visited Abu Dhabi earlier this year and (I'm not ashamed to say) it was love at first bite! It is usually served with some pita bread and cut up raw vegetables for dipping, but be warned - once you start dipping, you won't be able to stop. Preheat the oven to 190ºC. Make some slits in the skins of the aubergines with a sharp knife. Place them on a baking sheet and roast them in the oven for about 30 minutes. As soon as the skin starts to split, they are ready. Allow the aubergines to cool and then peel away the skin from the softened flesh. 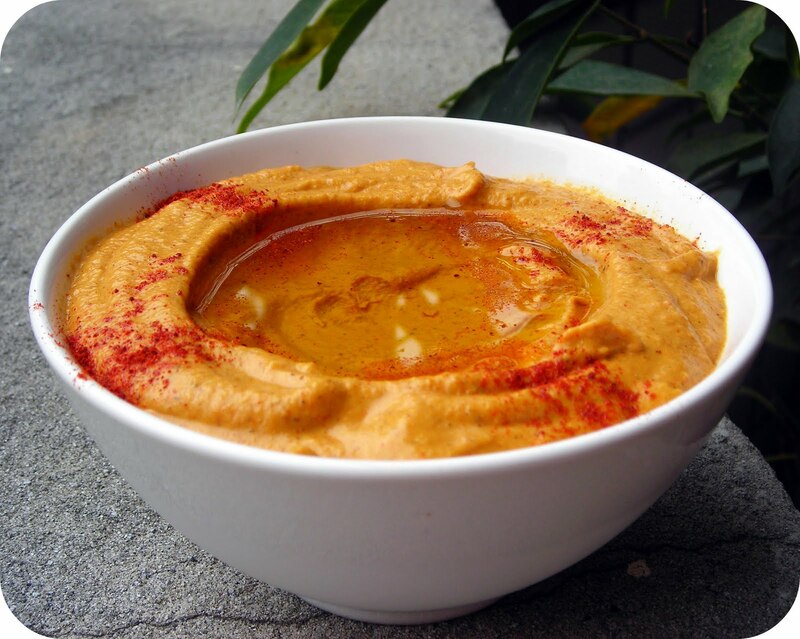 Place the flesh, tahini paste, garlic, lemon juice, paprika, salt and pepper in a blender or food processor. Blend it until you have a smooth paste. You can add a Tbsp or two of water or olive oil if the paste is too thick. Spoon the baba ghanoush into a dish and make a shallow well in the middle. Garnish with the extra paprika, chopped parsley, olives and a good drizzle of olive oil in the middle. Serve with pitta bread or vegetable crudités or some crusty baguette and dip away. * Tahini paste is available at speciality shops. 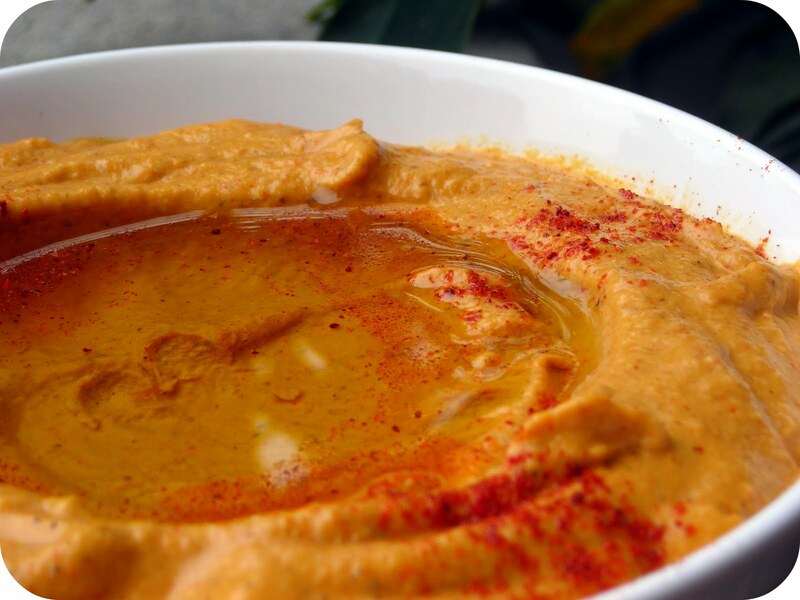 Some recipes substitute tahini with plain unflavoured yoghurt. Recipe adapted from The Taste of the Middle East, by Jenni Fleetwood. The Baba Ghanoush looks delicious, Kitchenboy. There are such lovely dishes around the world, but I'm sure most people are scared when they here the term 'eggplant dip', but as you said.. it's 'love at first bite'. Thanks for the comment, Marion! 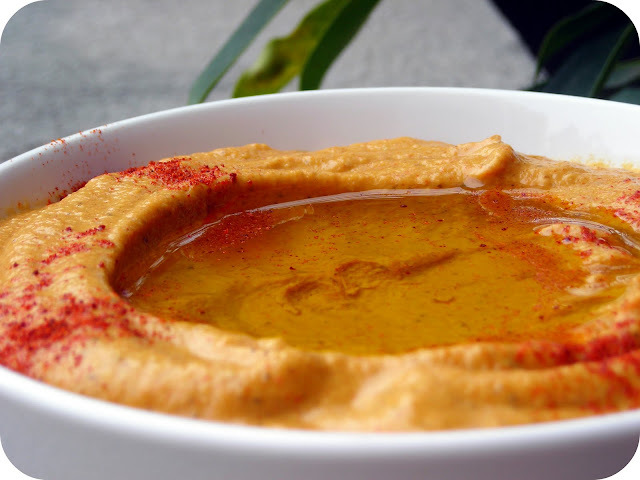 Yes, I love this dish (and of course moutable and hummus) SO much, I might consider moving to the UAE just for the food! I have tried to make this before, tasted great but looked terrible - more like something you would find in a newborn's nappy. I am now going to try your recipe, because this is beautiful. OMG I love baba ganoush! Oue of my favourites. Mouth-watering pics too! Hi Rose! Thank you so much for your visit and comment! I have to be honest - I was very surprised by the vibrant colour of this dish. I suppose you can use slightly less paprika if you want it less orange. But I do like the colour!